Ages 5 through 10. 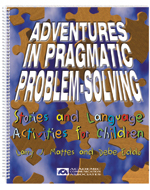 Use the short stories and thinking activities in this book to help children develop functional problem-solving skills and effective strategies for communicating when problems are encountered in various situations. The activities help students to verbalize solutions for problems, identify causes, identify consequences of behavior, and recognize the viewpoints of others. Reproducible worksheets are included. Part 1 of this book includes three types of activities that can be used to develop problem-solving skills. Activity A - Each of the stories in Activity A includes a picture and a short story in which a problem situation is described. The reproducible answer forms contain questions related to the problems presented in each story. Activity B - The stories in Activity B each include three or more pictures. After the student has listened to or read the story, ask him/her to place the pictures in the correct story sequence. Then ask the child to give the story an ending by providing a solution for the problem described. A variety of thinking questions follow each story. Activity C - The stories in Activity C require students to reaction to problems experienced by a character named Ryan during the course of a day. In Part 2, problems presented in short poems are discussed. Students respond to questions related to the problems described. Pictures are included for each activity. The book also includes high-interest role playing activities that allow students to interact as they solve various types of problems. The problem-solving skills in this book have direct relevance to success in meeting academic standards. Students are challenged to make comparisons, propose solutions, evaluate the actions of others, identify cause-effect relations, etc. as they talk about problems relevant to their everyday life experiences. The printed book edition and the CD edition are the same price if ordered separately. Save money when you order both the book and CD at the same time. The CD includes the entire book and makes it easy to print out copies of the reproducible pages. When ordering from this website, use the drop-down menu to select your preferred product format.